A large case lot of .308 ammunition from Prvi Partizan in the venerable .308 Winchester totaling 500 rounds. This is a great target round with a very tight inherent accuracy and a significant reliability record, with very tight velocity ranges and is a nicely finished product. It features a 145grain boat tail profile projectile that is full metal jacketed as well as a clean burning powder. All of this contributes to the sub 1.5 MOA accuracy that this cartridge delivers under most conditions. 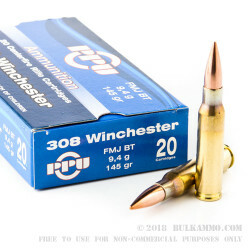 From a price point perspective, this is a serious value driven load that can easily replace your current plinking round of choice with a more accurate, cheaper variant. The Serbian outfit has been producing top tier ammunition since 1928 making it nearly 100 years old. They are known for their commitment to producing top quality military specification clones, that perform despite a significant price point decrease. This round is a perfect example of what has made them famous in the USA over the past couple of decades. 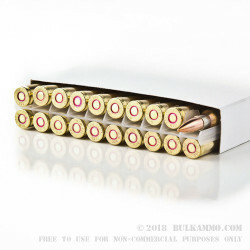 The small cost associated with a genuinely top tier offering in a popular military cartridge that civilians can get adequate performance out of. Such is the case with this reliably igniting and feeding cartridge with a 145 grain FMJ projectile that will improve your longer range performance for a low cost. 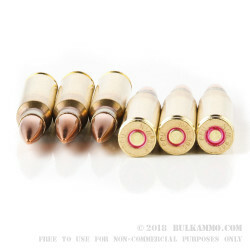 Q: Is this corrosive or non-corrosive ammunition? A: Hello Steve, Prvi Partizan ammunition is loaded with all non-corrosive components. A: Hello Ed! 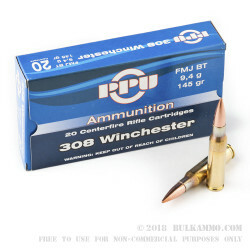 The .308 Prvi Partizan ammunition is designed with a standard FMJ bullet and will not attract a magnet.